An incredible blend of our hand crafted, organic and delicious Garlic Gold® Nuggets blended with the refreshing, incredible flavor of gourmet sea salt. This is truly a unique, gourmet, top of the line garlic salt. 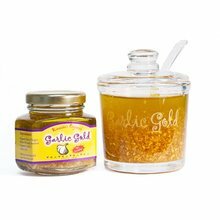 An incredible blend of our hand crafted, organic and delicious Garlic Gold® Nuggets blended with the refreshing, incredible flavor of gourmet sea salt. This is truly a unique, gourmet, top of the line garlic salt. Use it on everything: try it on popcorn, steamed veggies, baked potatoes, soups and salads. Weight: Approximately 1 pound Ingredients: Organic garlic, chopped and toasted to crunchy perfection in organic extra-virgin olive oil, blended with sea salt.